New Hampshire's motto is 'Live Free or Die,' and Republican lawmaker Dan Innis says the state welcomes LGBTQ conservatives like himself. There are only 559 known lesbian, gay, bisexual, transgender and queer elected officials in the U.S. — just 0.1 percent of all elected officials across the country — according to a recent report by the LGBTQ Victory Institute, a nonprofit that trains and promotes political hopefuls. But this election cycle, a record number of LGBTQ Americans, who make up an estimated 4.5 percent of the U.S. population, are seeking office. Can these candidates, who are running for positions ranging from town councilmembers to U.S. senators, help the LGBTQ community reach more proportionate representation? In a new NBC Out special series, “The 0.1 Percent,” NBC News profiles a handful of the hundreds of GBTQ Americans who are on the ballot this November. NEW CASTLE, N.H. — On a small island in Portsmouth Harbor sits Province House, built in 1660. The white clapboard home abuts Hart Cove, the confluence of the Piscataqua River and the Atlantic Ocean, and looks over the blackened stones that poke out along New England’s craggy coast. White sailboats gently bob on their moorings. Across the harbor: Maine. Today, Province House is Innis’ home, and he is the state senator for New Hampshire’s 24th District, which includes much of the state’s narrow seacoast. After Innis, 55, lost the Republican primary for New Hampshire’s 1st Congressional District in 2014, he served as the finance chair of the state Republican Party. Two years ago, a Republican official approached him and asked if he would run for the 24th state Senate District. “I had a four-way primary two years ago — three guys, married, kids. You know the typical American family,” Innis explained. “Then there was me — married with kids, but married to a man, and my kids are from a previous marriage. So it was it was different, and it was a little intimidating.” Innis ran and won. His status as a Republican officeholder who is also gay places Innis into a rare group — the LGBTQ Victory Institute estimates that of the 559 openly lesbian, gay, bisexual, transgender and queer elected officials across the U.S., just 21 are Republicans. While the Log Cabin Republicans, a gay conservative group, has existed since the late 1970s, it has little power, as the national party has long spurned LGBTQ supporters in favor of a larger bloc: religious conservatives. Of the hundreds of out candidates tracked this election cycle by the LGBTQ Victory Institute, just 18 ran as Republicans. 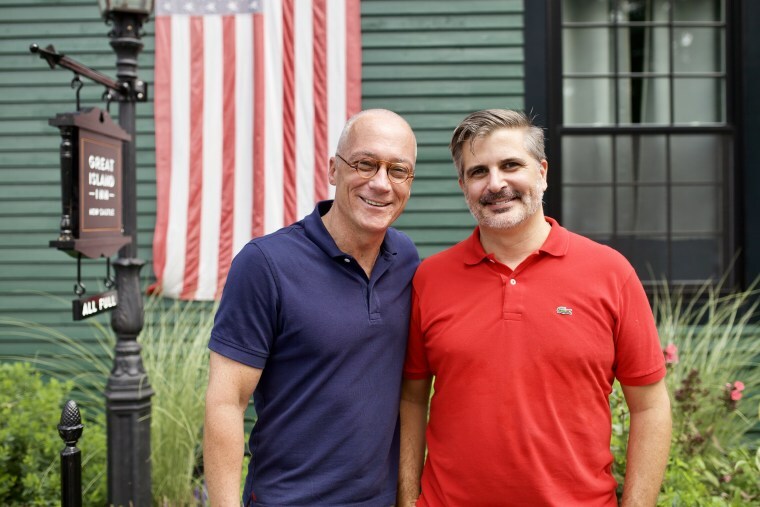 For Innis, New Hampshire represents a unique place where a conservative gay man can be accepted as a representative in state government. Innis said gay Republicans like him do change the “hearts and minds” of straight Republicans. After a month in the New Hampshire state Senate, Republican Bill Gannon sat down next to Innis and told him, “You’ve changed the way I think,” Innis recounted. A bill banning so-called gay conversion therapy, the discredited practice that purports to make gay people straight, made a tortuous three-year-long journey through the state legislature and was eventually signed earlier this year by Republican Gov. Chris Sununu. “If I hadn’t been in the Senate, I don’t think it would have gotten through,” Innis said. Gannon voted for the ban. Before he ran for office, Innis was dean of the University of New Hampshire’s Peter T. Paul College of Business and Economics. Today, he lives in New Castle with his husband, Doug Palardy. Together they own and operate an inn on New Castle Island. Innis married, had three kids and stayed with his wife, who knew he had “leanings,” until his early 40s, when he couldn’t deny who he was any longer. Innis says gay Republicans like himself are crucial to making the party more LGBTQ-friendly. However, when asked if he thought, as a gay Republican, he could be politically successful outside of a progressive state like New Hampshire, Innis was equivocal. “Could I win? I don’t know. Maybe in certain districts, but in New Hampshire, candidates like me can win,” he said. When asked about President Donald Trump, who promised to be a “friend” to the LGBTQ community during the 2016 presidential election, Innis grew more cautious. On a central question for the LGBTQ community today — whether “religious freedom” should allow individuals or businesses to refuse to serve lesbian, gay, bisexual, transgender and queer people, Innis breaks with the LGBTQ movement. This year, the Democratic National Committee is focusing on New Hampshire’s 24th Senate District as a local race it hopes to flip from Republican to Democratic. On Nov. 6, Innis will face off against Democrat Tom Sherman, a physician and two-term lawmaker in the New Hampshire House of Representatives. Innis is confident he will keep his seat. "When I win, I will continue to work for the people that I represent," he said. "I will continue to improve our business climate, protect the public health of all citizens with continued work on water quality, alternative energy sources, and protecting the beauty of our great state."